Bryce Canyon horseback riding, for a day or longer, is a relaxing way to enjoy the sights and solitude of Southern Utah combining exercise, adventure and access to some amazing natural wonders. We offer two types of rides, featuring camping & inn lodging. Trips range from 6 days & 5/6 nights, and include everything you need except personal clothing & accoutrements. Just 3 miles from Bryce Canyon National Park. Hotel or family cottage accomodations. Swimming pool, on-site restaurants, cottage kitchenettes, and fireplace suites. 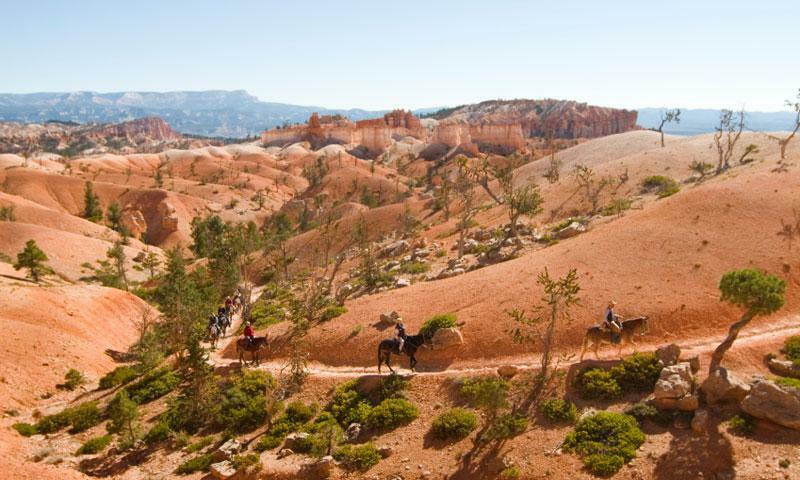 Descend into Bryce Canyon on Horseback for a 2 hour or 1/2 day tour. Age 7 and older. 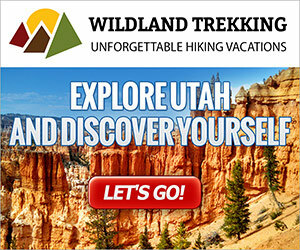 Mountain biking, fishing, and 4x4 tours! Close to Capitol Reef National Park, Boulder Mountain, the Grand Staircase-Escalante National Monument. Have you ever wanted to live like the pioneers, but with all the amenities of a five star getaway? Visit the Cottonwood Meadow Lodge. Plan a real adventure! Zip lines, mountain biking, rock climbing and more! Check out the adventure packages and private programs! Most Bryce Canyon trail rides take place in the summer in Southern Utah. Riders can follow some amazing trails through the state’s most incredible parks taking in forests, plateaus, canyons, rocky gorges and river beds. Depending on experience rides can last from an hour to a week and even children can participate. Wear sensible clothing and footwear – a helmet is usually provided by the stables or tour company. There are several outfitters advertised below which offer scenic Bryce Canyon horseback rides along the scenic rim trails. 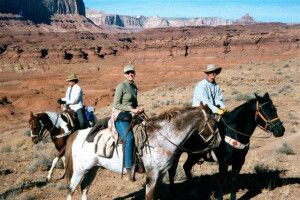 Bryce Canyon horseback riding with guides are offered from Sunrise Point and last for two hours or half a day. Riders descend to the floor of the canyon and the longer ride follows the Peekaboo Loop Trail with excellent red rock sights. A 1½ hour ride for beginners and experienced riders follows a 4½ mile loop from Ruby’s Inn on Hwy 63 across Dixie National Forest land to the northern-most amphitheater of Bryce Canyon National Park. When the ride leaves the rim, it climbs Bristlecone Pine Ridge with views of Boat Mesa and the Sinking Ship from the ridge. 3 hour ride for beginners and experienced riders traverses Losee Canyon in Red Canyon 12 miles west of Bryce on Hwy 12. It follows the trail of Butch Cassidy and Wild West stories are told by wranglers as part of the trip. This ride is for intermediate and experienced riders and lasts 5-6 hours. From Ruby’s Inn on Hwy 63 it explores Casto and Losee Canyons and hoodoos in the Little Desert area. 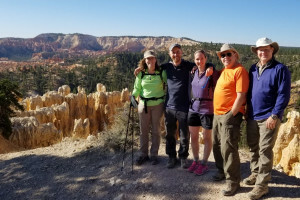 This 4 hour trip departs from Ruby’s Inn on Hwy 63 and follows Thunder Mountain Tail from the bottom of Red Canyon with switchbacks, narrow backbones and stunning views of hoodoos. Suitable for intermediate to experienced riders. This 5-6 hour ride runs from Ruby’s Inn on Hwy 63 up Sheep Creek and Willis Creek to see petroglyphs and Averett’s Grave. For beginners upwards. From Ruby’s Inn this 6-8 hour ride traverses Rock Spring's Draw before following the Johnson Hole Trail, an old cattle and sheep to the Paria River. Stop at Crack Springs for a drink, then the ride continues up the Paria River to some Native American petroglyphs.